Personality: Epiphany's personality, though multi-faceted, is mainly viewed as proud, quiet, and covertly hot-tempered. She has a high regard for both herself and her intelligence, often creating unnecessary drama over small issues relating to how others speak of her. However, once you spend enough time around her, it becomes clear that she also has a deep ability to care deeply (if not maybe too much) about those she loves. Fears: Epiphany is deeply afraid of losing her friends and those she holds dear to her. She has what some might call anxiety, causing her to fear rather many things, whether it be what someone thought about her or how the upcoming battle might turn out. -Because Epiphany is prone to caring too much about her friends and those who she loves, she is very easily lured into traps if she believes that someone is in danger. -She is also reckless with her hot temper and gets herself into trouble, perhaps trouble too big for her to deal with, when she argues at the wrong times. -Epiphany, although on the larger end of the spectrum, is not as strong as others and can be beaten in physical combat if her combatant has greater physical aptitude. -Epiphany, as a result of being so proud, can sit silently for hours on end if she feels like the conversation/event is below her interest. This can cause others to forget her presence and also makes her very good at sneaking around (despite her being all white). -She is very fast for a LightWing and can, with hard effort, go at the speed of 70 mph when she really, really needs to. -She has a very impressive logical mind and can often outwit her enemies to escape fighting or injury. The image at the top of the page is an image used w/ permission from DeviantArt and is what I pictured Epiphany looking like. The only changes I would make are the horns, which I describe below, and the fact that she has no saddle/armor on. 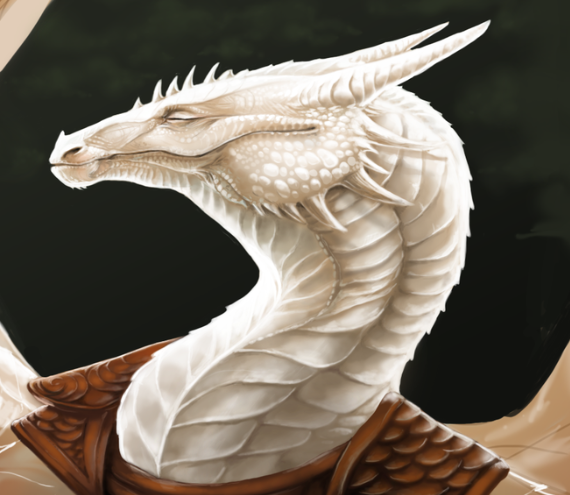 Scales: Epiphany's entire body is mainly white and light gray. The scales start light gray and much smaller at her snout and then fade out to white halfway down her neck, where they also become full size. Depending on her mood, her scales become darker or lighter (darker with displeasure/fear, lighter with happiness or positive adrenaline). When she's hot, she can loosen her scales a bit to allow air flow. Eyes: Yellowish orange, flecked with brown. She has large eyes that are bright and show intelligence. Appearance: Epiphany is, overall, a white dragon of graceful appearance and stature. Epiphany's head is darker than the rest of her body (mentioned in Scales). Her head is streamlined and graceful. Her mouth is long and extends past her eyes, and because of this she tends to look smug often. Her eyes are large and a startling orange-ish yellow. She has two long horns extending from her head, and underneath those two, a set of slightly smaller ones that are the same. Her forehead is host to a series of spines that start small, reach their full height halfway, and then dwindle away between her horns. Main Body: By now, her scales are pure white. However, with her mood, her scales tend to darken or lighten. The barrel of her body is shaped much like that of a dalmatian, meaning that her waist gets much tighter after her ribs end. She has subtle but sharp spikes lining her back. Tail: Her tail is long. The spikes from her back continue down her tail, fading away towards the end. Her tail's end is a blade, silver and darker than the rest of her. Legs: Epiphany has long but sturdy legs. Her feet have four toes, each with a long claw the same color as her tail's blade. She also has a small dewclaw further up on her legs. Wings: Although at first she may appear to not have wings, that isn't the case. They're there, but they flicker in and out with the appearance of a technical glitch (they're always there in terms of mass, however). They appear completely solid when she's using them. They are the same white as the rest of her body, but the webbing is slightly more transparent and is very vulnerable. Her wing claws are sharp and can grab things. Family: Epiphany doesn't know if her family abandoned her or was killed, but she knows for sure she doesn't have one around for her. This is part of why she's so protective of her friends- they're the closest thing she has to a family. Normal Abilities: Epiphany can breathe a concentrated beam of light that burns her enemies. This energy is very strong, but finite. Her light breath can run out if used too much, but light from the sun replenishes it. On cloudy days, she'd have to fly above the cloud layer to renew it. Her scales can also store this energy and then expel it later for a surprising burst of light in battle. It's not enough light to blind anything, but it certainly is a bit of a shock. Epiphany can, with great difficulty, change her size to become as small as she wants. This is very useful for getting out of traps and cages, and, in combat, can be used for escaping. However, the smaller she gets, the brighter she glows (at her smallest size, her light could illuminate half a valley), making it not-so-ideal for sneaking around or stealth missions. Her size limit is around 11 feet tall, but, at that size, the pain of having to compress all her atoms and cells into that form would be debilitating and would not be sustainable for over a minute (two or three posts). The effort of changing sizes also requires immense concentration, making it harder to battle and defend herself at the same time. Epiphany's combat style relies on her being very fast and agile. Her teeth and tail's blade are her strong points, and she will fight mostly with those two body parts. When she knows she's out-powered by her opponent, her main tactics are to either change her size to escape or to try to lure them into a trap using her wits. Aerial combat is hard for her, mainly because the webbing of her wings is very unprotected. She tends to try to avoid combat, but will fight fiercely nonetheless. History: Epiphany lives without a family amongst her LightWing Tribe. Her past has been fairly uneventful despite her vague memories of some traumatic event having to do with the reason she has no family. She has had her fair share of heartbreak, as some dragons are reluctant to be her mate, despite her attractiveness, because of her prideful demeanor. Epiphany's pain, though fully mental, is almost unbearable. She feels alone in her suffering, and as she's done on many nights before this, takes to the air almost without realizing it. She climbs higher and higher, knowing that in the open air she's game for bigger, more ruthless dragons, but closes herself to the fact. The clouds spread beneath her like a vast plain of frost, and she hangs suspended. She feels herself shrink, glowing brighter and brighter as her size dwindles, until the whole expanse of clouds is lit with ferocious light. She lets herself feel powerful. Until, through the brilliance, she sees the dragon. As for the special ability, it just seems too strong with not enough of a counter effect or limit. It would be a good idea to add a turn and size limit to the ability. This way, there are some hard limits. You can look at some of the recently approved dragons to get some ideas. You also left out your character list and normal abilities. Thanks for letting me know! Sorry if this an obvious question, but what is a character list? I'll take care of the other things now! No problem. Here’s where all the character lists are. http://www.rpgdragons.org/f84-character-registrationIt’s just a list of all your characters you make. Wake wrote: No problem. Here’s where all the character lists are. http://www.rpgdragons.org/f84-character-registrationIt’s just a list of all your characters you make. I've fixed (I think fixed, anyways) everything but the tracker option. I visited the link you gave me and, while super helpful, didn't seem to say exactly what a tracker does? I looked it up and found nothing. What other things could I make better? Well, you didn’t seem to do anything to the special ability to add some limits to it. Wake wrote: Well, you didn’t seem to do anything to the special ability to add some limits to it. I'm so sorry, I added quite a big limit and it seemed to not have gotten saved. Fixed it. Hey there! I'm Baldirak, an Admin here. To answer your question about the Tracker rank, a Tracker is basically like a hunter and/or a scout. Also, in addition to our site chat, we have a discord chat, so if you'd like to.join that, let us know. Baldirak Sapiens Draco wrote: Hey there! I'm Baldirak, an Admin here. To answer your question about the Tracker rank, a Tracker is basically like a hunter and/or a scout. Thanks so much! Application is finished now. What else should I add, if anything? Well, a house cat seems very small for a 32 ft tall dragon. You should probably choose something bigger. Not like any cage would be made expecting a dragon to be close to that small. Wake wrote: Well, a house cat seems very small for a 32 ft tall dragon. You should probably choose something bigger. Not like any cage would be made expecting a dragon to be close to that small. Hm.... Maybe change it from a time limit to a post limt. It’s easier to keep track of post limits when RPing then try and guess how long it’s been. Wake wrote: Hm.... Maybe change it from a time limit to a post limt. It’s easier to keep track of post limits when RPing then try and guess how long it’s been. I'm new to this site and don't know how many posts is the norm. Does three sound OK? Post length time wise can vary, but I’d say one post for the lower limit and maybe three or four for the upper limit of the ability would work. Wake wrote: Post length time wise can vary, but I’d say one post for the lower limit and maybe three or four for the upper limit of the ability would work. What is the max number of turns your character can shrink, and at what size? Wake wrote: What is the max number of turns your character can shrink, and at what size? Epiphany uses this power as last resort and can use this power once per battle, however, she will most likely not use it even that often. I listed her smallest size limit as a small horse, is that too small? Horse may still be too small. Maybe 10 ft tall. Would still be short for a dragon. Wake wrote: Horse may still be too small. Maybe 10 ft tall. Would still be short for a dragon. Thanks for advice! Fixed it. Wake wrote: Everything looks good. Approved. Thanks so much for helping me with everything!